Samir Amin (1931 – 2018) – from the Critique of Capitalist Development to the Rejection of Political Islam. Samir Amin, (1931 – 2018). This Sunday, August 12, 2018 we learned, with great sorrow and sadness, of the passing the eminent development economist Professor Samir Amin on the eve of his 87th birthday. 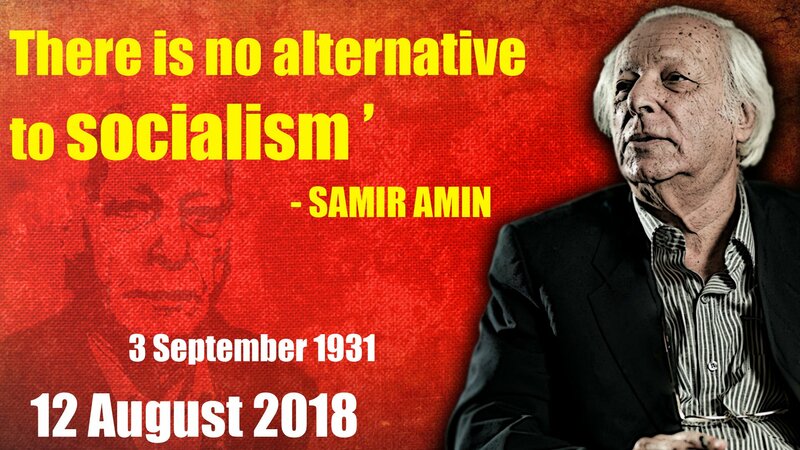 An illustrious thinker, the late Samir Amin leaves behind a wealth of economic thought on developing economies that he has inspired since the early sixties by his many publications and thought-provoking conferences. As its Director for 10 years (1970 – 1980), IDEP is particularly touched by the passing of one of its pioneer-directors who made an indelible mark in the history of IDEP through his accomplishments in training and research in the domains of development planning and economy management in Africa. His astute leadership enabled the institute to gain and strengthen its identity in the delivery of capacity development and research programs that were strongly tailored to fight against underdevelopment. With Samir Amin, IDEP gained momentum and is proud to be continuing on with this momentum, almost forty years later, in delivering on its mandate of building the capacity of African countries to effectively plan for their development and efficiently manage their economies. In this sad moment, we offer our condolences to his family and to the African continent, to which he has always devoted himself with remarkable zeal and dynamism. United Nations Economic Commission on Africa. “UN BAOBAB EST TOMBÉ” : SAMIR AMIN, LE THÉORICIEN DU DÉVELOPPEMENT INÉGAL, EST MORT l’Humanité. Samir Amin, l’économiste du Sud, est mort Le Monde. Samir Amin (1931-2018) was one of the world’s greatest radical thinkers – a ‘creative Marxist’ who went from Communist activism in Nasser’s Egypt, to advising African socialist leaders like Julius Nyerere to being a leading figure in the World Social Forum. Samir Amin’s ideas were formed in the heady ferment of 1950s and ’60s, when pan-Africanists like Kwamah Nkrumah ran Ghana and Juliuys Nyrere Tanzania, when General Nasser was transforming the Middle East from Amin’s native Egypt and liberation movements thrived from South Africa to Algeria. Africa looked very different before the International Monetary Fund destroyed what progress had been made towards emancipation and LiveAid created a popular conception of a continent of famine and fecklessness. Yet through these times, Amin’s ideas have continued to shine out, denouncing the inhumanity of contemporary capitalism and empire, but also harshly critiquing movements from political Islam to Eurocentric Marxism and its marginalisation of the truly dispossessed. Amin believed that the world capitalism – a rule of oligopolies based in the rich world – maintains its rule through five monopolies – control of technology, access to natural resources, finance, global media, and the means of mass destruction. Only by overturning these monopolies can real progress be made. This raises particular challenges for those of us who are activists in the North because any change we promote must challenge the privileges of the North vis-à-vis the South. Our internationalism cannot be expressed through a type of humanitarian approach to the global South – that countries in the South need our ‘help to develop’. For Amin, any form of international work must be based on an explicitly anti-imperialist perspective. Anything else will fail to challenge structure of power – those monopolies which really keep the powerful powerful. Along with colleagues like Andre Gunder Frank, Amin see the world divided into the ‘centre’ and the ‘peripheries’. The role of peripheries, those countries we call the global South, is to supply the centres – specifically the ‘Triad’ of North America, Western Europe and Japan – with the means of developing without being able to develop themselves. Most obviously, the exploitation of Africa’s minerals on terms of trade starkly favourable to the centre will never allow African liberation, only continual exploitation. This flies in the face of so much ‘development thinking’, which would have you believe that Africa’s problems come from not being properly integrated into the global economy which has grown up over the last 40 years. Amin believes in fact Africa’s problem stem from it being too integrated but in ‘the wrong way’. In fact, as long as the monopolies of control are intact, countries of the centre have had few problems globalising production since the 1970s. Sweatshop labour now takes place across the periphery but it hasn’t challenged the power of those in the North because of their control of finance, natural resources, the military and so on. In fact, it has enhanced their power by reducing wages and destroying a manufacturing sector that had become a power base for unionised workers. So there is no point whatever in asking countries of the centre to concede better trading relationships to the peripheries. Amin is also concerned at environmental activism which too often becomes a debate about how countries of the centre manage their control of the world’s resources, rather than challenging that control. It is vital that Northern activists challenge the means through which the ruling class in their own society exerts control over the rest of the world. Amin’s views on political Islam brought him to the attention of many secularists, including this Blogger. Political Islam in the Service of Imperialism 2007. Monthly Review. On an initial reading he offered a rigorous critique of Islamism. All the currents that claim adherence to political Islam proclaim the “specificity of Islam.” According to them, Islam knows nothing of the separation between politics and religion, something supposedly distinctive of Christianity. It would accomplish nothing to remind them, as I have done, that their remarks reproduce, almost word for word, what European reactionaries at the beginning of the nineteenth century (such as Bonald and de Maistre) said to condemn the rupture that the Enlightenment and the French Revolution had produced in the history of the Christian West! On the basis of this position, every current of political Islam chooses to conduct its struggle on the terrain of culture—but “culture” reduced in actual fact to the conventional affirmation of belonging to a particular religion. In reality, the militants of political Islam are not truly interested in discussing the dogmas that form religion. The ritual assertion of membership in the community is their exclusive preoccupation. Such a vision of the reality of the modern world is not only distressing because of the immense emptiness of thought that it conceals, but it also justifies imperialism’s strategy of substituting a so-called conflict of cultures for the one between imperialist centers and dominated peripheries. The exclusive emphasis on culture allows political Islam to eliminate from every sphere of life the real social confrontations between the popular classes and the globalized capitalist system that oppresses and exploits them. The militants of political Islam have no real presence in the areas where actual social conflicts take place and their leaders repeat incessantly that such conflicts are unimportant. Islamists are only present in these areas to open schools and health clinics. But these are nothing but works of charity and means for indoctrination. They are not means of support for the struggles of the popular classes against the system responsible for their poverty. On the terrain of the real social issues, political Islam aligns itself with the camp of dependent capitalism and dominant imperialism. It is the latter assertion, which straightforwardly answers the false assertion that Islamism contains a kind of sublimated ‘anti-imperialism’ which is attractive. This was clearly sensed by his critics who tried to claim that the reactionary nature of political Islam was hidden behind a “welfare” vision of society. While in many ways this seems strange perspective today in the light of the rule of Daesh, Turkey may make the case for a synthesis between authoritarian populism and Islamist welfarism. There were and are equally clear difficulties in claiming that Islamism was in some unexplained manner not “really”anti-imperialist. Yet various forms of actually existing Islamism were engaged in armed combat with….imperialism well before they began murdering civilians outside of their own lands. The point is that if the left is ever to become serious in challenging militant/political Islam, it has to move past and dump its heavy baggage of Eurocentrism and the careless analysis of political Islam. The current wave of militant Islam is a force to reckon with, and dismissing it as reactionary—true as it may be—is unhelpful. Yes, militant Islam has an extremely narrow ideological view of Islam, and an exceedingly oppressive vision of societal change, especially concerning the treatment of women. This vision is not shared by the vast majority of Muslims in Afghanistan, Egypt, Indonesia, Pakistan, and even India. That being said, this dominant obscurantist current of political Islam in Afghanistan, Iraq, and Pakistan is also locked in military/guerilla combat with U.S. imperial power and client states in the region. But here’s the rub, militant Islam is also supported by people in these respective regions not, as mentioned earlier, because they support its vision of a Muslim “welfare state” rather, the support is because the United States is seen as ruthless, anti-Islam imperial occupier. Alongside, people in these states are also very tired of the tactics of Islamists, especially as they terrorize and target unarmed and uninvolved people. Overwhelming numbers in Muslim-majority states would like the Islamists to disappear, just as they would also wish the same for U.S. imperial presence and the client regimes that rule over them. If this complexity could be grasped, it may enable people on the left as well Western political leaders and the media to desist from homogenizing the makeup of entire Muslim-majority societies as reactionary or obscurantist. Similarly, the popular anti-imperialist sentiment in Muslim majority states should not be confused with the actions of militant Islamists, which are not anti-imperialist. Militant Islam is conceived and imagined in the present, current context. It is, therefore, a “modern” manifestation that posits its own version of the Islamic “welfare state” for the current conjuncture to rival the Western capitalist state and Enlightenment notions of modernity. Understanding militant Islam in its current context will only enable the development of a coherent strategy of opposition and an alternative non-Eurocentric vision of society. Amin defended this analysis, focusing on how different forms of political Islam could be simultaneously ‘modern’, that is a part of a globalised world, and backward-looking, with their textual and ritual evocations of utopias. Political Islam is a modern phenomenon. Tariq does not see that this was my thesis. All of the ideological, political and social movements of the “modern” world (i.e., of actually existing capitalism, which is both globalized and polarizing, thus imperialist by nature) are modern, because they are inseparable from capitalism. Bourgeois democratic liberalism, whether conservative or reformist, socialisms (social democracy, historical communisms), fascisms, ethnocentrisms (or para-ethnic movements), the nationalisms of the imperialist powers, the nationalisms through which dominated peoples express their resistance, movements of “religious renaissance” in all their forms, be it liberation theology, apparently “fundamentalist” revivals, both Christian and others, and new sects, all these movements are “modern”. But it is not sufficient to understand them simply as modern. Even more, it is necessary to choose between them and identify those which move society forwards and, on the basis of a critique of capitalist modernity, participate in inventing socialist modernity. the fact that the movements inspired by such formulations have recruited their rank and file from the most disadvantaged classes does not change the reactionary utopian character of these formulations. I include political Islam (even political Islams, in the plural), but also political Hinduism, political Buddhism, North American Christian fundamentalism, new sects and others, in this large family of illusions, apparently attached to the past (but in fact modern) and able to mobilize the “poor” in certain circumstances. Their success, like at the present moment, is the result of the failure of the relevant (socialist) lefts to oppose capital’s offensive, which has seized the historic opportunity provided by the erosion and then collapse of the progressive forces that had formed the world after the Second World War. Amin was nevertheless primarily interested in the geopolitical game. The region of the Greater Middle East is today central in the conflict between the imperialist leader and the peoples of the entire world. To defeat the Washington establishment’s project is the condition for providing the possibility of success for advances in any region of the world. Failing that, all these advances will remain vulnerable in the extreme. That does not mean that the importance of struggles carried out in other regions of the world, in Europe or Latin America or elsewhere, should be underestimated. It means only that they should be part of a comprehensive perspective that contributes to defeating Washington in the region that it has chosen for its first criminal strike of this century. This view, which puts the conflict between ‘imperialism’ and the rest of the world, became more trenchant as the years went by. The ongoing U.S. project of military control over the planet by its armed forces, supported by their NATO lieutenants, the erosion of democracy in the imperialist core countries, and the medievalistical rejection of democracy within Southern countries in revolt (taking the form of “fundamentalist” semi-religious delusions disseminated by political Islam, political Hinduism, political Buddhism) all work together toward that dreadful outcome. At the current time the struggle for secularist democratization is crucial for the perspective of popular emancipation, crucial for opposition to the perspective of generalized barbarism. But imperialism came to play its role. Counterpunch summarised his opinions in 2017. A main pillar of Amin’s thought is that far from battling political Islam, the NATO and US have enabled such regional movements as a divide and conquer approach to maintaining power. This critique upends the dominant narrative of Uncle Sam’s war on terror as a noble pursuit. In Russia and the Long Transition from Capitalism to Socialism, Amin presents a thought-provoking interpretation of Russian history in the global system. It involves geography and history and of course human agency. He considers the Czarist Empire and the colonial empires, quite different. Further, Amin considers Lenin and Stalin and the Ukrainian crisis, the latter of which constitutes no small threat to widening armed conflict. Russia remains a pivotal nation on the world stage, in spite of its capitalist restoration. Its importance as a counterbalance to the imperialism of the Triad (US, Europe and Japan) is Amin’s special focus, and for good reason. For many the belief that US was involved in the rise of Daesh seems an unproven and tied to conspiratorial claims about the ‘sponsorship’ of the Islamic state made by supporters, amongst others, of the Assad regime. Amin, it might be said, failed to keep up with developments inside Islamism. He ignored the self-driven ideological causes and nature of the Deash genocidal and totalitarian regime. There is a disregard for the weight of doctrine. There is no serious analysis of its relation to earlier forms of political Islam and the ideologies of radical Salifist currents that were drawn to jihad. There is nothing on the buds of tyrannical “micro-powers” of Islamism dispersed across the world including within the ‘West’ and the way in which these can become ‘proto-states’ in trying to create a racist misogynist Caliphate. In short, neither the ‘global jihad’ nor the blood-drenched reality of Islamist rule in Iraq and Syria, the Taliban and Boko Haram, the jihadis of the Maghreb and Mali, and the Somalian killers, can be explained only in terms of geopolitical rivalries, or, as a regression to a pre-Enlightenment ‘utopia’ in modern political and technological armed dress. Amin’s defence of a “multi-polar world” was nevertheless a positive vision of the future. A genuinely multipolar world will become a reality only when the following four conditions have been satisfied. Real advances towards a different, ‘social’ Europe, and hence a Europe that has begun to disengage from its imperialist past and present and to embark on the long transition to world socialism. Evidently this implies more than a mere exit from Atlanticism and extreme neoliberalism. The prevalence of ‘market socialism’ in China over the strong tendencies to an illusory construction of ‘national capitalism’, which would be impossible to stabilize because it would exclude the majority of workers and peasants. Success of the countries of the South (peoples and states) in rebuilding a ‘common front’. This is also essential to provide the leeway for popular classes to impose ‘concessions’ in their favour and to transform existing systems of rule, replacing the dominant comprador blocs with new ‘national, popular and democratic’ blocs. Advances at the level of national and international legal systems, harmonizing respect for national sovereignty (including moves from state to popular sovereignty) with respect for all individual and collective, political and social rights. Amin opposed the Muslim Brotherhood root and branch, “We should not just look at the Muslim Brotherhood as a political Islamist power but as a backward movement that rejects workers movements and social justice, preferring to talk about charity as a form to ensure their control over the people,” he once said, according to al-Ahram.” The New Arab. Perhaps Amin’s central thesis is somewhat obvious, but it’s often forgotten – that a true revolution must be based on those who are being dispossessed and impoverished. But he goes further in undermining the assumption that any thinking emerging from the South will lack enlightenment, or that a lack of enlightenment should be excused. He believes the Enlightenment was humanity’s first step towards democracy, liberating us from the idea that God created our activity. He has caused controversy in his utter rejection of political Islam. This ideology, embedded for example in Egypt’s Muslim Brotherhood, obscures the real nature of society, including by playing into the idea that the world consists of different cultural groups which conflict with each other, an idea which helps the centre control the peripheries. (1) Again, opinion is perfectly manipulated on the subject. Jihadism is only the inevitable product of the triad’s continued support of reactionary political Islam inspired and financed by Gulf wahabism. The exercise of this so-called Islamic power is the best guarantee of the total destruction of the ability of societies in the region to resist the dictates of liberal globalization. At the same time, it offers the best pretext for giving the appearance of legitimacy to NATO’s interventions. In this regard the press in the United States acknowledged that Donald Trump’s accusation – that Hillary had actively supported the establishment of Daesh – was well founded.” Samir Amin Blog. « Brexit, Racism and the Far Right: what some new anti-Fascists ignore. Kitty, he was not just arguing that Daesh was created by the ‘conditions’ of invasion and war in the region but that it was consciously created by the West, a theme dear to conspis in many Arab countries, who often include Israel as well in the plot. It’s impossible for a Muslim to criticise another Muslim. He has to pin the blame for ISIS on non-Muslims. Why isn’t he examining the failure of the Muslim (and African) left to construct mass parties against imperialism? Could it be something to do with Stalinism? The supporters of Islamism-distorted form of progressivism but basically allies against imperialism hated him. Sounds like a pretty good recommendation to me…. I don’t know Samir Amin’s views on the Sisi dictatorship in Egypt. However, basically all serious accounts say it is even worse both than the preceding (elected, right-wing) Muslim Brotherhood government and the Mubarak dictatorship before that. Really Sue? Is ‘Stalinism’ the original sin of the left? Have any Trotskyites ever been able to construct mass parties? Does dean believe that political correctness resides in the numbers that can be persuaded to join a political party or any organisation? In which case, I’m off to join the Catholic church. Samir Amin was not one of my favorite people. He was a “soft Maoist,” which is why he fit in so well with most of the 1970s Monthly Review milieu.